-Flat nozzle can't be used on this welder. -We have put the exchange of the heating core image on our listing. -We suggest the pipe and the black wire can be trapped together for much convenient working. -After the electric wire is broken, you can take the gun shell connection screw, remove the gun core, with the same specifications of the gun can be replaced. -Welding torch with the complete light to light, so as not to break the gun part of the refractory porcelain material, leaving the electric wire short circuit. -For the first time, there may be spitfire or smoke. This is a normal phenomenon, power will automatically disappear after 5 minutes.When the torch, please adjust the temperature to the lowest, until the barrel can be cooled before cooling, so as not to waste heat damage machine Pieces, affecting the service life. ✔The plastic welder is very easy to use for repairing plastic. Handy and flexible split design. US standard. 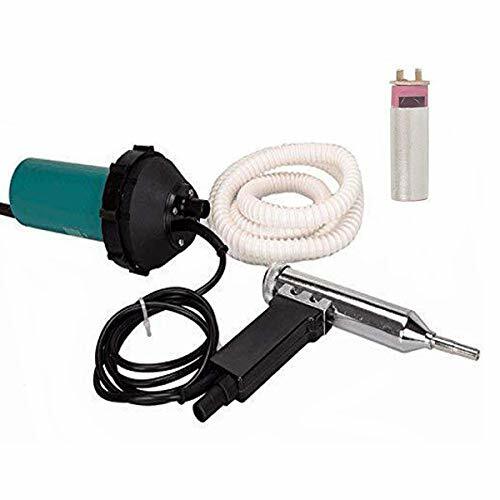 ✔High quality hot air torch gun heats up very quickly. You can plastic weld efficiently. ✔9 levels variable heat temperature settings adjustable from 40-550℃ for different kinds of plastic. ✔The plastic welder kit weighs only 1.2kg, less less than an averaged solder iron. It made repair work more enjoyable than a struggle. ✔This plastic welder will turn plastic into a molten puddle very fast allowing you to complete repairs quickly and efficiently.A must have tool for plastic welder. If you have any questions about this product by Go2Home, contact us by completing and submitting the form below. If you are looking for a specif part number, please include it with your message.